For one of the evenings of entertainment we were required to being a Cabaret outfit. I went to the fancy dress store and ended buying a beautiful purple top hat to match my waistcoat. But when I got home, I realised the hat wouldn’t fit in my rucksack! And even if it did it wouldn’t end up in Thailand in the condition it started in. My housemate then asked me a leading question that ended up in a challenge. “If you are going to carry it on the plane, why don’t you do something with it?” Okay, I like where this is going. What are you thinking? 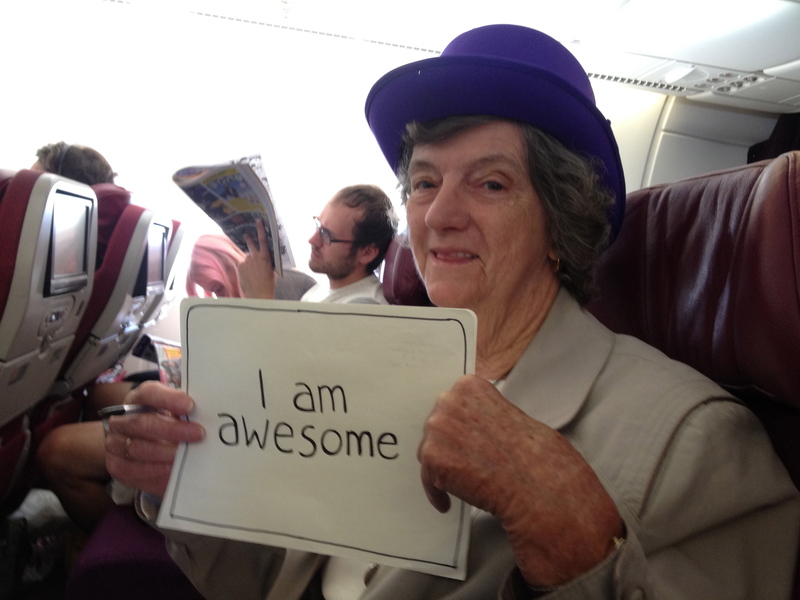 “So you are going to Awesomeness Fest….why don’t you get a photograph of somebody on the plane, wearing that hat, holding a sign that says ‘I am awesome’..?” Immediate excitement filled shoes as I thought about how I could turn a boring 13 hour flight into a fun social experiment and arrive at Awesomeness Fest with a bang!! 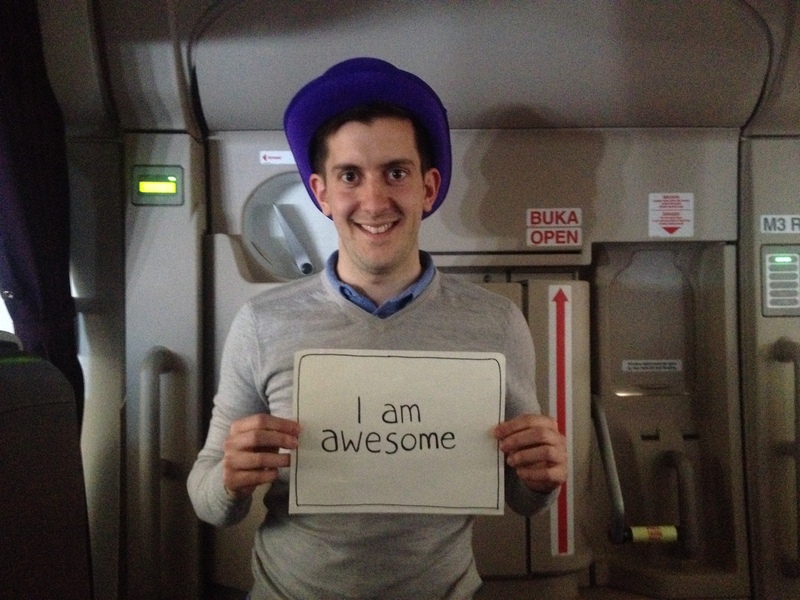 The next morning I was sat in the departure lounge, pen in hand writing ‘I am awesome’ on a page of my notebook. I tore it out and was ready. I just needed a handful of courage and the fun would begin. As someone who may appear super confident, cheeky and courageous I suddenly felt extremely nervous about the whole idea! I walked past people with an intriguing smile as if to suggest I was doing something cool but I wanted them to invite me to speak to them. My inner shyness and feeling of not wanting to disturb people meant I walked past about 8 possible candidates. Ah, this was harder than I thought it would be. As I stood at my gate waiting to board my plane, I started to rationalise it not being the right place to approach people. 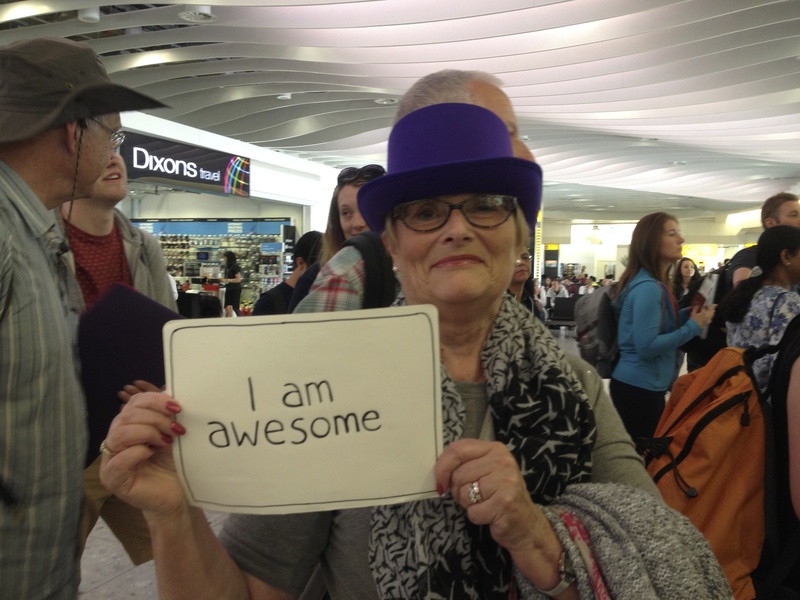 The airport is a serious place, maybe people won’t appreciate it….Then suddenly I got a tap on the shoulder “Are you awesome?” A lady had read the sign I was deliberately displaying and wanted to challenge me. “Yes, I am indeed. How about you? You look awesome..” Her explanation of her awesomeness was superb. Lynn and her husband were flying from London to Australia, just to babysit for their daughter for 3 nights!! Wow, I know. Fully deserved of a photograph with a purple hat! I then told her more about my challenge and that I needed 50 people to do it by the time I arrived in Thailand. After agreeing to be number 1 and persuade her husband to be number 2, I got a much needed piece of advice! She held my arm and smiled and said “If you are going to get 50 people to do this, you are going to have to be a lot more assertive!” I learnt my first lesson. I heard what I was feeling. I nodded with conviction in a slightly apprehensive way. It was time to get out of my comfort zone! I boarded the plane with a bit more of a spring in my step, as people say the first one is always the hardest. My next candidates were to be my flight neighbours. They were in for a treat and display of awesomeness whether they liked it or not! 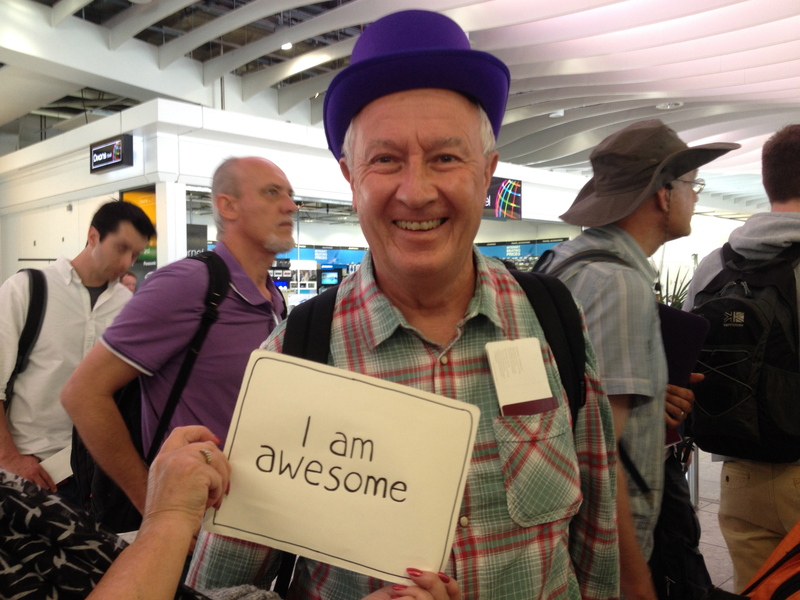 I wasted no time in drawing attention to my purple hat and my handwritten ‘I am awesome’ sign. As I walked to my seat a few people looked curiously, a few smiled and one of the flight attendants said “Yes you are!” I quickly explained I was doing a project I needed 50 passengers to help me out with photos. I thought the cabin crew would be open to fun and possibly essential in allowing me to wander the plane taking photographs and talking to people. Awesome passenger number 3 taught me that if what you are asking is reasonable and you do it in a nice way, people will find it hard to say no. Pat Harvey from Australia wasn’t about to sing and dance in the hat but was happy to share her awesomeness and have a photo. The best story of my many conversations to come was from my other seat neighbour, a lady from East Timor, a small country near Australia. After inviting her to speak about her awesomeness I unleashed an amazing life story about how she fled her county in 1999, saving her young family from the conflict and crisis that killed hundreds of innocent people. She was flying back home with her Sister as she was just visiting her family in the UK. Her sister didn’t speak any English and hadn’t travelled before so she was keeping her company. We spoke for around 45 minutes about how she managed to create her new life in England for her children, working 3 jobs with her husband and doing everything she could give them a life they dreamed of. Her story so was moving, and reminded me that everybody has a story of overcoming some form of adversity and struggle. Although I had a challenge of photographing 50 people, I suddenly realised what I had intended as a collection of photographs, was evolving into an opportunity to inspire people and collect stories of awesomeness! I stayed with the story until it came to a natural end. I did after all have 12 hours left to achieve my mission! The next few people were willing and open to help me. I strategically stood in the area near the toilets, knowing that people had time to kill. Most people were curious about the hat and the project anyway and certainly a conference called ‘Awesomeness-Fest’! In an effort to have good quality conversations I started to ask people different questions. I asked one of four questions depending on how open I thought they were to talking about awesomeness, a slightly fluffy topic. 1. What is the most awesome thing you have done? 2. What does it mean to be awesome? 3. What makes you awesome? 4. What awesome things would you like to do in the future? After 30 minutes of dedication interactions and a mini photo-shoot, I was asked to returned to my seat as we were expecting turbulence. I had 15 photographs, various definitions of awesome, more inspiring stories and a sense of achievement that I had pushed through my comfort zone. I contently watch a film and had some surprisingly good flight food. This was a key moment. Part of me said “Great work, 15 people, lots of inspiring conversations, well done. You’re work is done. 15 is great, you don’t need to get 50 people. 15 is okay. 15 is great.” But another part of me felt like I was making excuses. Even though it was a made up project, I thought about the story I wanted to arrive at Awesomeness Fest with. A really impressive one, or one that is okay but not really wow. My goal is always to inspire people through my actions. To do things that make people say wow, I want to do some of that. My mind was made up. I knew from somewhere I had to muster the courage to get really out of my comfort zone and find another 35 willing people to join the fun. The thoughts that were stopping me were ones of not wanting to disturb people, about how I thought they would feel about sharing their awesomeness and general fears that I cast to rationalise staying in my seat. But fortunately, my understanding of the mind allowed me to see the excuses for what they were. I managed to flip the feeling of ‘what if they don’t want to …’ to ‘I could make their flight a little bit more exciting and hopefully remind them of how awesome they really are!’ I asked Pat nicely if I could get out of my limiting seat and finish what I started! To fast forward a story, I went to involve the cabin crew, approached anybody with a slight warming presence and started to create momentum. I was stood at the front of the plane with people suddenly asking to have their photo taken. With 1 hour left to go I had 34 photos and could use the target number to lure people to help me achieve my mission. 50 photographs by the time I got to Awesomeness Fest in Phuket! I quickly preceded to gather some final stories and inspire people to remember how awesome they are! The spring in my step was ever present as I landed in Thailand to a conference full of hand picked awesome people. I’d had the most exciting flight ever and arrived ready to share my awesomeness with the everyone. – With every problem lies an opportunity. By sharing the problem with somebody else will often lead to creative solutions. Thanks James! 2. Set an exciting goal that is almost realistic and challenges you. – At first I was only planning to get one photograph, but I wasn’t excited by it at all. Sometimes making the challenge bigger gives you more motivation. Having said that, if I’d set the goal too big I would have been daunted and not attempted it. Once you have the courage to start, people will want to help you. – The first one is always the hardest. But once you have the first person on board, you will get the confidence you need! – Achieving the goal is great. But what is even greater is what you have to do in order to achieve it. Being outside your comfort zone, the learning and the overall experience. The more you practice pushing past the limiting voices the easier it becomes. – Being in a situation and doing something don’t expect to see is an easy way to get attention. People are naturally curious, intrigue them! – Having the feeling I was doing this other than for myself gave me much great motivation and conviction to follow through on my plan. Turn a 13 hour plane journey into something fun. 10. Do more awesome things. – Great learning comes from doing things and then reflecting afterwards. Even small projects can inspire other more than you think! I did this on my way to Awesomeness Fest. What are you going to do? My amazing friend Andy Dunn shared his Awesomeness experiment with the world today and it is not just fun reading but it also inspires to do things that are outside of our comfort zone to learn new lessons, experience awe and to have awesome days!! Thanks Lee! Really appreciate your feedback. I know, it’s easy to forget amongst the craziness. It was amazing to take the time and hear such inspiring stories. Often the simplest reminders can be so powerful! Andy, this was amazing. I loved reading this. Everyone has an awesome story within them, and not enough people want to hear them. Thank you for posting this, I feel inspired to do something awesome now.